Know your customer has a new meaning. 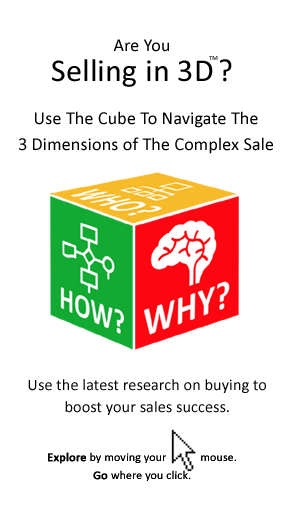 In this era of stalled buying decisions and increasingly complex buying processes sellers cannot really know their customers without understanding how and why they buy. If you don’t know the DNA of buying in your customer’s organization then you are going to face some surprises. You are going to be handicapped in terms of understanding and indeed predicting the buyer’s behaviour. This can hinder the salesperson in closing the deal. Is Your Customer Research Missing Something? – Executive biographies (job titles, roles, past experience, etc.) and organizational structure. But, what is missing from this list of information required on a customer, or prospect? Well, it is information about how the company buys. When you think about it, that is a very surprising omission! Why Research How The Organization Buys? You need to scan not just the corporation, but the buying organization too. Think of it as the difference between an X-Ray and an MRI scan. The MRI gives you a picture of the organization’s internal organizations (the projects, departments, managers, etc. ), the xRAY gives the skeletal framework that holds it all together. That is the policies, processes, roles and responsibilities that are increasingly being shaped by procurement. How many of your need analysis questions examine the buying organization within the corporation? 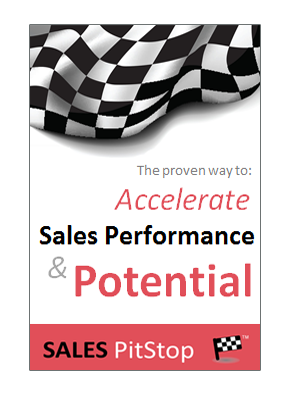 Sales books provide sellers with lists of resources to research a customer, or prospect. They include sources such as; Hoovers, Industry Periodicals, News Archives and SEC filings. But there is no x-Ray! The traditional sources reveal little about how the organization buys. Are You Researching What Can Stall The Sale? Ask your sales team to make a list of the reason why deals are lost or stalled. You might expect to find “our solution did not fit” or “they don’t need a solution”. However, such responses are surprisingly uncommon. They are greatly out-numbered by other factors related, not to the proposition, or the need, but rather to how the organization buys. – A change in strategy. These factors, although vitally important in the sale, typically come as a surprise to sellers. That is because they are not examined in the traditional approach to researching a customer, to pre-qualification and to needs analysis. What Is The Procurement Context For The Purchase? It has long been said that ‘people buy from people’. But we are not just selling to a person, we are selling to an organization. If it was the person that was buying it would be easy. But it is not, it is an organization that is buying and that is where the complexity comes in. The bigger the organization the greater that complexity is likely to be. How the organization buys and how this particular buying decision is going to be made are increasingly inseparable. Yet, sellers typically pay little attention to the general procurement environment in their customer accounts, including the many threats that it can present. Do you know the broader procurement context to your deal? To draw an analogy it is like looking at a painting on a wall, without noticing the frame, or even the room it is in. The organizational context in terms of how buying decisions are made cannot be neglected. Otherwise the seller can be caught off guard when, for example, the customer decides to consolidate suppliers, procurement gets involved, or Corporate (HQ) issues a new dictate. To understand the broader context of the buying decision or its overall procurement environment, requires being able to answers questions such as those listed below. It also requires being able to appreciate why they are relevant to the seller in the first place. As you read the list you will notice that some of these things are difficult to know in advance of selling to an organization. They may even require an ongoing relationship before they can be discovered. 1. How Powerful Or Sophisticated Is Procurement? For example: Is procurement centre led, or decentralised and is it siloed or cross functional? Is there a procurement policy, setting out its principles, policies and standards? What is the procurement style – is the focus on cutting costs or driving results, or controlling or coaching? 2. How Strategic is procurement within the organization? For example: Is procurement seen as strategic to the organization and its competitive advantage? Does the organization take a longer term view when it comes to buying decisions? This is key to understanding its power and influence. 3. Is There A Category Management Approach? Does the organisation tailor how it buys to the product, or service being bought? Is the approach being adopted to buying your category the right one? What does the future of your category look like for the organisation? Is the category manager an expert in the category? Too few suppliers resulting in supply risks, or over dependency? 5. What is the organisation’s approach to Risk Management? Is the organization sensitive to supplier related risks? Is there a formal risk management process? 6. Does The Organization Use Procurement Technology? For example: Is there a focus on reducing paperwork and administration around buying through the use of technology? Are Procurement systems being used in areas such as managing sourcing processes, or supplier performance management? How will your systems interact with the buyer’s to achieve this end? 7. Is There A Focus On Spend Management & Analysis? Does the organization have real time visibility over what is being spent? Has a spend analysis been undertaken? Is the organization exploring ways to reduce or manage demand (e.g. The implementation of web conferencing to reduce travel costs)? 8. Does The Organization Care About Supplier Performance Management? How is supplier performance appraised? Does the organization collaborate effectively with important suppliers and invest in their development? Does it care about innovation through its supplier base? 9. Is Procurement Compliance Driven? Is compliance with internal buying processes and procedures mandatory? What are the implications for managers or departments of buying from unapproved vendors, or bypassing procurement? 10. Is Outsourcing on the agenda? Relative to others in its industry where is the organization in terms of the adoption of outsourcing, both within procurement and other areas. What are the organizations future plans in this area? Know your customer has a new meaning in B2B selling. When you know the DNA of buying in your customer’s organization then you increase your chances of winning the deal. You reduce the chances of being surprised when a deal slows down or stalls and more importantly you will know how to move it forward.